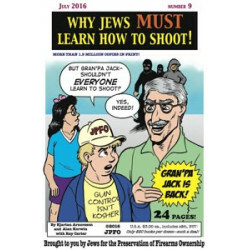 Gran'pa Jack 9 - Why Jews MUST Learn How To Shoot! This is no ordinary comic book. If you want to open someone's eyes--including your own--get and read Why Jews MUST Learn How To Shoot! Time to peel away the political lies and anti-rights campaigns, arguing about which gun laws to pass. Sheesh. Jews--and everyone--should be out there shooting. Politicians should be encouraging you. Can you name the top 20 reasons to learn how to shoot? They're in there.